Eyebrow transplants are one of our fastest growing procedures at Kolstad Hair Restoration. Full, elegantly sculpted eyebrows are now an option for everyone through a surgical procedure that can be performed in the office. Eyebrows frame the eyes. They convey anger, surprise, emotions, beauty and youth. An eyebrow transplant is a process of moving hairs from the back of the scalp and placing them into recipient sites created on the face. This procedure is one of the most technically challenging to perform. Each of the transplanted hairs needs to be placed in a specific orientation, direction and a consistent density throughout the eyebrow. Dr. Kolstad’s expertise in both hair restoration and facial plastic surgery helps improve aesthetic outcomes and natural appearing results. Both men and women can lose eyebrows for a variety of reasons. Some common causes include medications, chemotherapy, thyroid disorders, trauma, and burn injuries. Repeated waxing, threading and plucking can also result in partial or complete loss of eyebrow hair. Some ethnicities have genetic tendencies for thin, underdeveloped eyebrows. Regardless of the cause, many patients can experience a significant increase in eyebrow density through the process of eyebrow transplant. At Kolstad Hair Restoration in San Diego, we offer both FUT and FUE eyebrow transplants. The difference between the two procedures is how the hair grafts are removed from the back of the head. FUT refers to the process of removing a strip of scalp in the back of the head to obtain the grafts. Using state-of-the-art Neograft technology hair grafts can also be removed one at a time during an FUE procedure. Eyebrow transplants can be used to add volume to areas of thinning or to create an eyebrow that was lost completely. An important concept of eyebrow transplants is that hair grafts borrowed from the back of the scalp will continue to grow long and quickly. Most people will have to trim the transplant brow hairs about every two weeks to keep them from growing too long. Sometimes the transplanted hairs will need to be sculpted using conditioner to help them lay flat against the skin. After completion of the eyebrow transplant procedure, it can take up to a full year to achieve final results. Many patients experience initial growth of the transplant grafts around three months after the procedure. To increase density, a touch-up procedure may be required. Eyebrow transplants typically require 150-400 hair grafts per eyebrow. The number of grafts depends on the density already present as well as the length and width of the desired eyebrow. We do not charge per graft, we prefer set pricing for eyebrow transplants. What Is The Ideal Eyebrow Shape? More than any other feature on the face the shape, thickness and position of the eyebrow is altered according to trends. The goal of eyebrow transplant is to create a youthful eyebrow relying on concepts of normal human anatomy instead of fashionable trends. There is never one eyebrow shape for every face but general rules apply to creating a youthful brow. 1: The medial origin of the eyebrow should be in the same vertical line as the nostril and medial canthus (inner corner of the eyelid). 2: The highest point of the eyebrow arch should be at a line above the lateral limbus of the cornea (2-3 mm away from the outer edge of the iris). 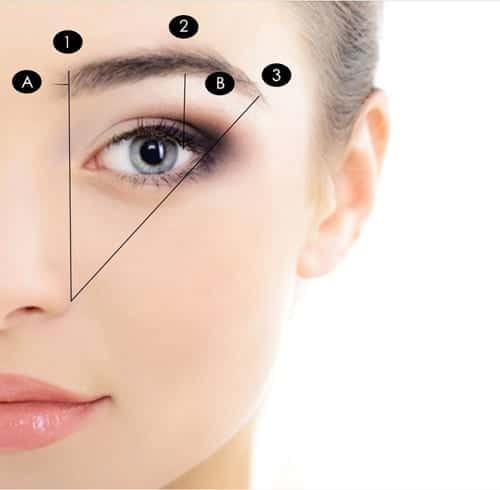 3: The eyebrow should end at an oblique line connecting with the nostril and the lateral canthus (outer edge of the eyelid). The height of the inner and outer brow should be in a similar vertical plane. A: Ignoring rule 1 and placing the eyebrow closer to the middle can make the nose appear more narrow. B: The peak and curvature of the eyebrow depend on face shape and ethnicity. Many people of Asian descent have eyebrows that are naturally much higher and some ethnicities have eyebrows possessing very sharp peaks. For many faces, a straighter brow is more youthful and more elegant. On the day of your eyebrow transplant, you should plan for around four to six hours to complete the surgery. You will be awake throughout the procedure. The process begins with Dr. Kolstad marking your eyebrows indicating the placement and orientation the grafts will be placed. You will have a chance to review the eyebrows to confirm the direction and orientation. Some patients prefer to draw in their own eyebrows. The donor site area on the back of the scalp is trimmed very close to the skin. Hair from the nape of the neck is softer, thinner and more closely related to eyebrow hairs. Depending on your preference and the number of grafts required, the donor hair will be removed using the FUT or FUE techniques. Dr. Kolstad will numb the back of your head to make sure you in not in discomfort for the extraction. Using the Neograft hair follicles will be removed one at a time. The graft extraction process can take 2-4 hours to complete. The most common feedback we receive is that laying prone (on your stomach) for a long duration can become tiring. You are able to get up, stretch, go to the bathroom and otherwise move around at any time during the day. After the grafts are removed most patients take a break for lunch. Dr. Kolstad inspects the hair grafts to make sure they meet the required criteria for insertion. Damaged or poor quality grafts are discarded. Small needles are used to create insertion points in the eyebrow skin. The needle is beveled in the same orientation of the surrounding hairs to ensure parallel hair shaft growth. One at a time the hair grafts are placed into the skin where the brow will be. A pressure dressing is placed over the donor site and the post-procedure instruction are reviewed. The extraction sites are easily covered by the longer hair above the donor site. It takes about a week for the extraction sites to heal without crusting. The eyebrow grafts will have a small amount of scabbing present for about 7-10 days. Dr. Kolstad removes the pressure dressing one or two days after the surgery. He will inspect the healing and review the after-care instructions. Out-of-town patients are recommended to spend at least one day in San Diego following their procedure before departing on a flight home. Most of our patients take a week off of work to recover from the procedure for cosmetic reasons. For more information on receiving an eyebrow transplant in San Diego, CA, call our office and schedule your appointment with Dr. Kolstad.